New disclosures from Pentagon officials say samples of live anthrax were sent to three Canadian laboratories. The scandal now involves anthrax sent to labs in 12 states, Washington, DC, and three countries – Australia, Canada and South Korea. An unnamed Pentagon official not authorized to speak publicly told USA Today that, so far, no one had been sickened by the shipments, and that military investigators are continuing to search anthrax samples and records to discover whether further samples were shipped to other labs. The Pentagon admitted last Wednesday that live anthrax was inadvertently shipped from a military lab in Utah across state lines and out of the country over a one-year period from March 2014 to April 2015. The research samples were mistakenly marked inactive, according to officials. The agency said the public was not at risk from the anthrax spores, which, if inhaled, can spark a high fever and other flu-like symptoms and be lethal even with treatment. The samples, which the military said were shipped commercially, were for use in determining whether a new detection test for anthrax and other organisms works as expected. A Maryland lab first notified the Department of Defense about the live spores after receiving one of the shipments. So far, 28 labs in 12 states and the District of Columbia have received samples, the Centers for Disease Control and Prevention said. CDC bioterror lab regulators and the Pentagon are investigating why the military lab hadn’t thoroughly killed the anthrax specimens before shipping. An email sent to a CDC official said the methods used to kill anthrax spores are not always fully effective. 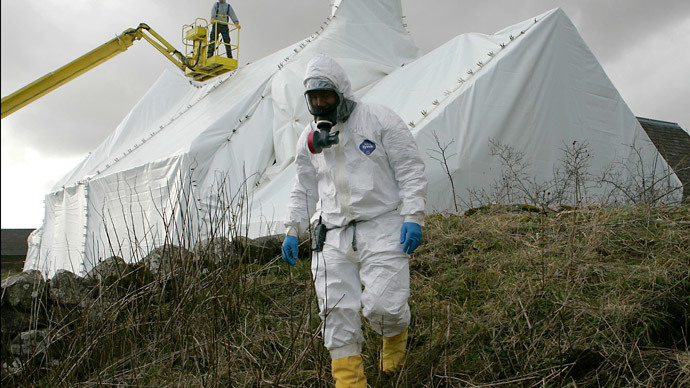 “We have concern that the inactivation procedures, when followed properly, are inadequate to kill all spores, and the US government is developing an approach to securing such possible samples from misuse,” wrote Daniel Sosin, deputy director of the CDC’s Office of Public Health Preparedness and Response, in an email to state officials that was obtained by USA Today. Anthrax is known to be one of the most difficult microorganisms to kill, and the bacteria can survive for years in the form of tough spores. The Army facility zaps the anthrax with radiation, which is supposed to render spores permanently inert, but errors can still occur. “One of the things that can happen is that they set it up, and they do it, and they find out later that it only kills 99.99 percent,” Paul Keim, a biologist at Northern Arizona University who studies anthrax, told Minnesota Public Radio. CDC spokesman Jason McDonald said four workers in three states are being treated for possible anthrax exposure. Separately, the military says that 22 individuals at Osan Air Base, a US facility in South Korea, are also receiving treatment.